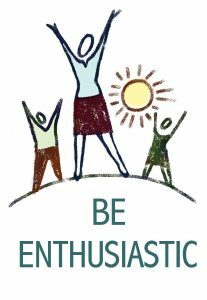 What does it mean to be enthusiastic? Enthusiastic people have an intense enjoyment of life. They make an ordinary drive through the countryside an adventure. They make opportunities out of problems. They turn strangers into friends. Why? Because enthusiastic people are interested in those around them. They don’t go through life in a ho-hum manner. 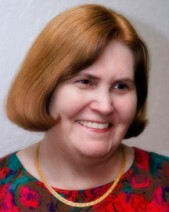 They appreciate the gift of life and live it with warmth, zeal, and passion. They love God. They love people. They love life. Let’s take a deeper look at the word enthusiasm. In the Greek, “en” means “in.” “Theos” means “god.” So basically enthusiasm means the Spirit of God within a person. Now there’s a concept for you! God living in you! When God lives in us, how can we help but be just a little enthusiastic? Since God is with us everywhere we go, we should never lack for enthusiasm, but we do, don’t we? We block that Spirit. We stay self-absorbed. We don’t smile. We don’t connect with others. We are embarrassed to let God’s Spirit overflow from us to others. So how does one keep enthusiasm? Perhaps the answer is in Romans 12:2. Paul says, “Do not conform to the pattern of this world, but be transformed by the renewing of your mind.” It’s this renewing of the mind and spirit that keeps us enthusiastic. Consider this… Each new day is the one God has made. 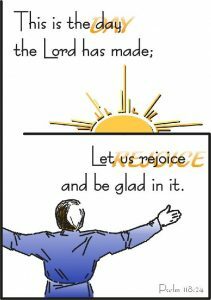 We need to rejoice and be glad in it. (Psalm 118:24) That’s what enthusiasm is all about. Enthusiasm keeps life interesting and exciting. It keeps us from getting bored with daily routines. It keeps us energized, engaged, and focused. Focus is so important. We must keep our focus on Jesus. From a spiritual perspective, we can’t “work up” our own enthusiasm if it is going to be real. True enthusiasm can only come from God living in us. One final thought… If anything is worth doing, it is worth doing with all your heart.